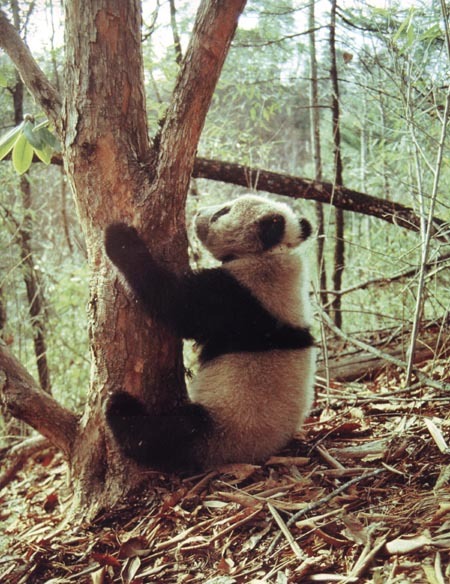 The giant panda (Ailuropoda melanoleuca) first appeared in the evolutionary record during the late Pliocene or early Pleistocene, some two to three million years ago. Panda fossils have been found in Burma, Vietnam, and particularly in eastern China, as far north as Beijing. Pandas were once widespread in southern and eastern China and in neighbouring Myanmar and north Vietnam. Today, however, there are only around 1,000 left. All of these are found in one geographic region - the bamboo forests of southwestern China. Giant pandas are classed as bears by most scientists. Unlike other bears, they vocalize by bleating rather than roaring. Until recently, giant pandas were grouped with raccoons and lesser pandas (i.e., the Procyonidae (raccoon) family). This decision was based primarily on physiological evidence. In the late 1980's, DNA/serological studies clearly established that giant pandas are clearly more bear than raccoon. Some scientists want to place giant pandas in their own grouping; but for most bear researchers, this does not seem warranted.